The following tips have been gathered by yours truly after years and years spent experiment with any and all protein powders in my kitchen. In case you’re wondering, the answer is yes: tastebuds were harmed in the making of this list. And yes, ingredients were sacrificed and feelings were hurt. But it’s the only way one learns, you know? By failing, learning, falling, getting back up, and trying again. 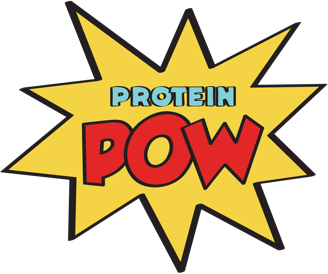 I had to go through a LOT of trial and error, in the early days of Protein Pow especially. 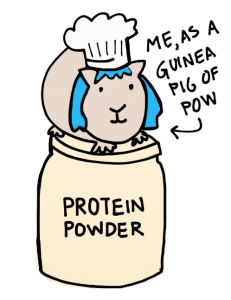 See, when I started, I was one of the only people properly experimenting with protein powders – in the world! 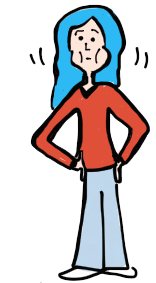 So there was no guide for me to follow; there was no handbook or existing knowledge-base for me to consult. It was just me and endless tubs of you-name-it, getting to know one another as I pioneered my way through a whole new world of protein powder cooking. Needless to say, I made a TON of mistakes in the process: rock-hard cakes and muffins, wooden-tasting cookies, brick-like cheesecakes, pancakes that could probably seal tire holes… I made it all. Make sure you consult (and ideally, memorize) my Protein Powder Substitution Chart so you know which powders are substitutable with which. The chart is a great first step to acquaint you with the powders. If you want to then learn more about them, check out my Introduction to the Powders Article. You can find a short version here and a longer one on pages 10-13 of The Ultimate Protein Powder Cookbook. Never bake a batter comprised of primarily protein powder – this is particularly the case when they’re making pancakes or protein muffins/cakes. 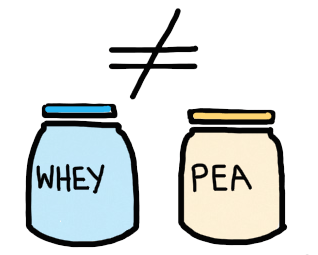 If your batter is over 1/2 protein powder, your food WILL turn out really dry and rubbery, especially if the powder you’re using is whey or casein. Always use a moisturizer when making protein pancakes or baking protein cakes or muffins. What’s a moisturizer? A moisturizer is an ingredient that will ‘weight down’ your protein powder and add moisture to your food. 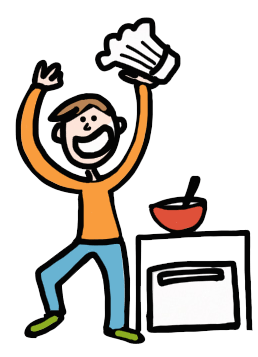 You NEED a moisturizer when you’re cooking with whey and casein (otherwise will food will come out dry and rubbery). You also need one when you’re cooking with the veggie powders (like pea, rice, and hemp) because they tend to be very dense and need moisture to start singing. Here’s a list of my favorite moisturizers: bananas, Greek yogurt, cottage cheese, quark, cooked sweet potatoes, pumpkin puree, applesauce, and (cooked) beets. If you’re baking Protein Cookies, you MUST use fat. This can be coconut oil, nut butter, actual butter, or even lard if you want to go ‘paleo’ on your cookies. Personally, I like using either coconut oil, nut butter, or a combo of the two. Here’s a good example of a Protein Cookie recipe using nut butter AND coconut oil. 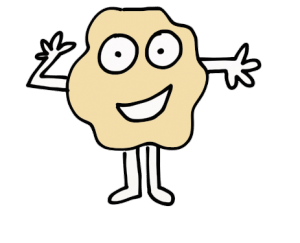 What I want you to remember is that, if you want to end up with a moist and crunchy cookie, you NEED to use some sort of fat. If you don’t, they’ll end up like ‘cookie-breads’ instead of cookies and they’ll never be crunchy. They won’t even be soft. They’ll just be like… thick cardboard. Mmmm, right? No. You cannot make Protein Fluff without an electric apparatus like one of the ones drawn to the left here. In other words, you can NOT whip up protein fluff by hand. I don’t care if you see yourself as a ‘Speedy Gonzalez of the Whisker’ or think of yourself as having a jacked-up arm that can whip things up at supersonic speed. You can’t make protein fluff by hand; it’s just humanly impossible (unless, of course, you have a specially-designed bionic arm whose sole function is electrical blending and whisking). When cooking with egg protein powder, remember that you HAVE to ‘reconstitute’ it. That means adding enough liquid to it to turn it into liquid egg whites. 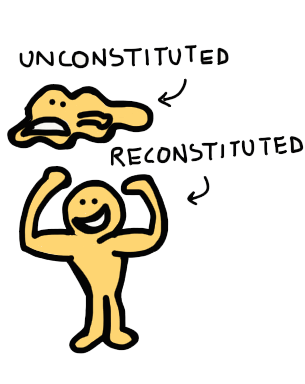 If you don’t reconstitute it (i.e. bring it back to ‘life’), whatever you’re making will end up like a weirdly rubbery and salty ‘thing’ that’ll leave you with sadface and nothing else. 10. Never bake a Protein Cheesecake until it’s solid and your knife comes out clean. As with every cheesecake, you have to take it out from the oven while it’s still a bit wobbly in the center. The reason for this is that the cheesecake will continue cooking once it’s out. It’ll set as it cools. So you don’t want to bake it until it’s all solid because then a lot of its creaminess will have been obliterated. How do you know how wobbly it should be? Just eye it up: if it wobbles just a bit (kind of like a set panna cotta), it’s done – take it out. If it wobbles like crazy and looks wet in the center, leave it in. You basically want a subtle wobble – not a sludge. Since we’re on the topic of cheesecakes, remember to never add egg – or egg whites – to your cheesecake bases. You don’t want to make a cake out of the base mix, you want something that’ll be densely packed and ‘crumble-cookieish’ in texture. 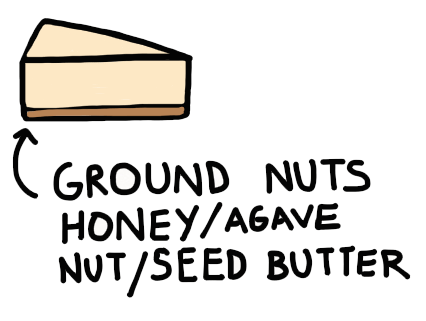 I swear by my Three Ingredient Cheesecake Base and I recommend you try it too because it’s the best cheesecake base I’ve ever come up with; it’s comprised of three ingredients: 1. nut/seed butter, 2. honey/agave, 3. ground nuts. That’s it. You don’t need anything else. Just mix those three ingredients together, press them onto the bottom of a springform pan, and kapow-POW! You got yourself the best protein cheesecake base on the planet. Here’s a great example of this base in Protein Cheesecake Action. I mean, that’s why I created them after all! To save you guys from having to go out there and scout out a bunch of ingredients and then worry about the perfect ratios. Think of the mixes like protein flour – the perfect combo of high-quality protein and gluten-free raw flours to allow you guys to bake, cook, and make raw snacks like protein bars etc. 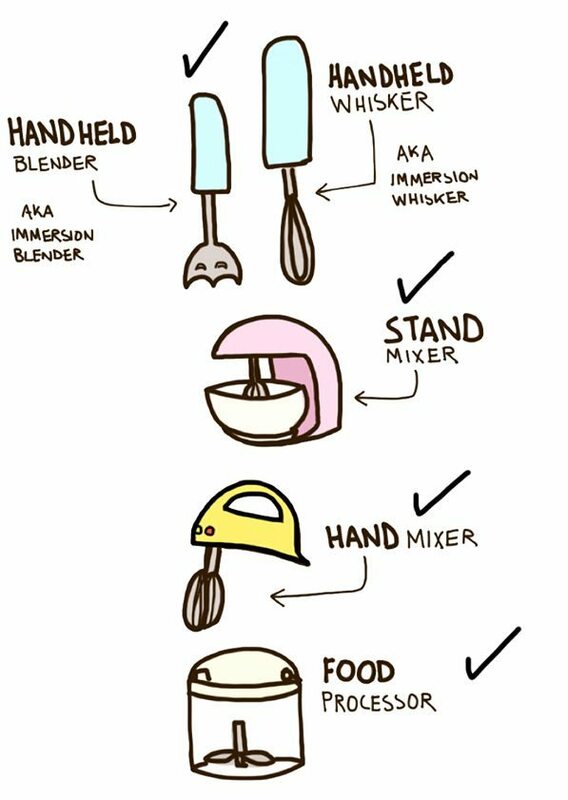 You can treat the mixes just like you would regular white flour in traditional recipes! A 1-1 sub, how about it? 13. DON’T FORGET TO ENJOY YOURSELF AND HAVE FUN! 1. Don’t be overly rigid or scared about experimenting with your powders, ingredients, and flavors. 2. Throw your hat into the air. 3. Turn up your music. 4. Dance +/- The Funky Chicken (while, for example, waiting for your pancakes to cook or your cake to be ready) 5. Sing or whistle while you bake. 6. Sample your batters. 7. Listen to your tastebuds. 8. Draw outside the lines and think outside the shake! And if you need any more ideas, get the Pow book; it’ll serve as a guide to help you get into the swing of Pow and transform you into the bona fide protein wizard that you absolutely have the power of becoming.